Protect your T325 series grill with this high quality grill cover. This grill cover is made from heavy duty PVC polyester. The material is UV protected to prevent colour fading and features a 3-inch ventilation strip to reduce moisture buildup under the cover. 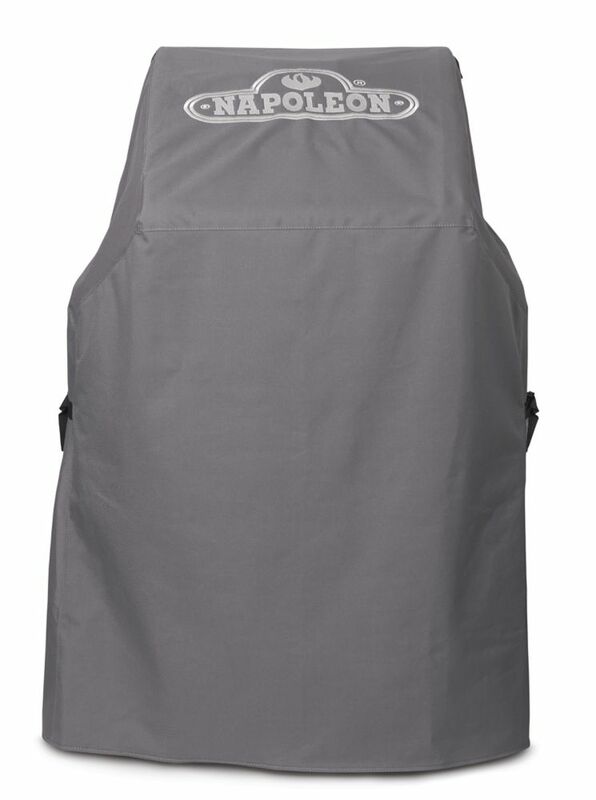 This cover features a large embroidered Napoleon logo to show your Napoleon pride and two metal hanging loops for storage when the grill is in use. Superior protection for your barbeque from harsh weather and debris. This unique BBQ cover features the patented Innerflow System which prevents condensation from building up on your grill, while also keeping the weather elements out. The Innerflow vents also work as handles for easy removal. Made from a weatherproof heavy-duty vinyl/polyester material that does not crack or peel, and easily fits over your grill. Comes with tie down straps with a quick release buckle to keep it secure, and hanging rings for easy storage. The cover is also UV protected, and will remain mildew and fungus free. Protect your LEX730 grill with this Premium Grill Cover. The durable, water resistant fabric won't crack, and the improved inhibitors provides superior fade resistance. For year round full weather protection for your grill, the Premium Grill Cover can't be beat. Adjustable straps with buckles secure the cover under a grill's side shelves, while the vent allows for airflow preventing mildew, as well as protection on gusty days. Easily store your cover out of the way with the convenient hanging loops. Use the Velcro panel on the front for easy access to the grill cabinet storage, and for easy covering and uncovering of the grill too. Triumph 325 BBQ Cover Protect your T325 series grill with this high quality grill cover. This grill cover is made from heavy duty PVC polyester. The material is UV protected to prevent colour fading and features a 3-inch ventilation strip to reduce moisture buildup under the cover. This cover features a large embroidered Napoleon logo to show your Napoleon pride and two metal hanging loops for storage when the grill is in use. Triumph 325 BBQ Cover is rated 5.0 out of 5 by 3. Rated 5 out of 5 by Anonymous from Excellent Cover Great heavy duty, quality cover. It has a couple of straps on each side to secure the cover, so it won't blow off. Rated 5 out of 5 by brownie from Well made and strong material I bought this for a new BBQ and it is great. Fits nice and snug and covers the whole BBQ.